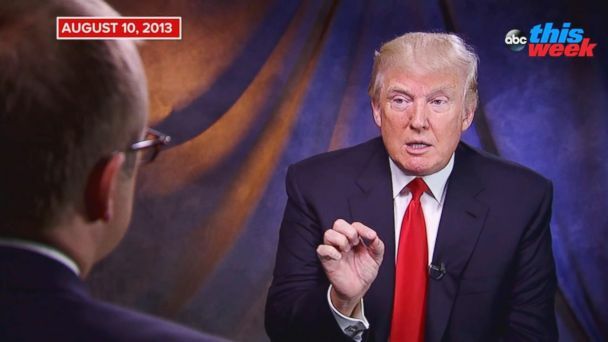 Five years ago today in August 2013, I sat down with Donald Trump in Iowa, where he was once again toying with the idea of running for president. Few people back then were taking his presidential ambitions seriously, and some of our exchanges are fascinating in hindsight. This clip shows how remarkably consistent Donald Trump can be. Back then, Trump was already confident about the slogan he would run on: "Make America Great Again" - nearly two years before he officially announced his 2016 run. I asked him, "If there were a Trump campaign, what would the motto, the logo, the saying, tagline be?" Trump responded, "If I had a campaign and if I decided to run, I think it would be very simple for me to say, 'Make America Great Again,' and the word 'again' is a very important word because right now we're a debtor nation. Right now, we're a collapsing nation in so many different ways. Right now, we have a real unemployment rate, you heard my speech, of probably 16 percent. We are a nation in trouble. So I would say the tagline would be 'Make America Great Again.'" This never-before-aired exchange also shows how dramatically Trump can change his views. Here's what he had to say about Amazon owner Jeff Bezos and his purchase of The Washington Post. That's a striking contrast with the president's current attacks on the Post. Just last month, the president tweeted "the Amazon Washington Post do (sic) nothing but write bad stories even on very positive achievements - and they will never change!" He also tweeted in July, "In my opinion the Washington Post is nothing more than an expensive (the paper loses a fortune) lobbyist for Amazon." This Sunday on ABC's "This Week," I'll sit down with another unconventional, potential presidential candidate -- Stormy Daniels' attorney and Trump antagonist Michael Avenatti.